Wilsonart Zenith Rouille Tops Off Stunning Copper Kitchen Transformation. A complete kitchen rebuild isn’t a task to be taken lightly – either financially or in terms of design and organisation. Determined to bring order to the chaos, homeowner Sian Bowman decided on a complete rethink of the family kitchen/office which was too crowded and disorganised areas to make a single large room with ample worktop and preparation space. 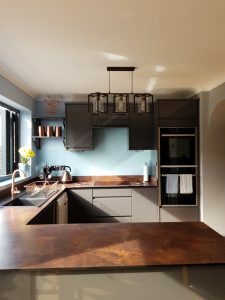 The family chose striking graphite grey units from Wickes and decided that as the design features a large area of worktop, it was worth looking for something special that would add a luxury touch and be easy to care for. A browse through a trade magazine led them to solid core worktops – a material only recently introduced to the kitchen market and already enjoying considerable success. Leading worktop manufacturer Wilsonart has been a pioneer in the introduction of solid core worktops. Wilsonart’s innovative Zenith range is a collection of on-trend solid compact worktops available in three distinctive ranges: Zenith Classic, Zenith Pure and Zenith Revolution. At just 12.5mm thick, Zenith creates a contemporary and cutting-edge design statement that is the perfect choice with high gloss furniture. The solid black interior means there is no need for edging. Zenith’s solid core offers complete design flexibility and the 100% waterproof surface is perfect for any kitchen or bathroom design. With a multitude of realistic styles and sensual surface textures to pick from, this completely solid worktop material will enhance any kitchen or living space. The material is also extremely heatproof and is impact resistant. A quick wipe over with a damp cloth keeps the surface clean and smart. The family chose Rouille from the company’s Zenith range. Rouille tops have a striking worn copper effect and a slightly textured finish. Matching upstands added the finishing touch that brings the kitchen design together. The worktops were supplied by JP Distribution who carry a range of six decors from the Zenith offer and were able to deliver directly to the customers home. Zenith tops are easy to install and can be cut without the need for specialist equipment. Because the material is impervious to water, the tops can be used with on-trend built under sinks. Sleek drainer grooves can be cut in the surface, showing the contrasting black interior. Wilsonart offers an installation kit and full instructions needed to install the tops.